Stathis Vasiloudis is a male forward from Greece, who has been playing for Panaitolikos in Greece since January 1, 2016. Stathis Vasiloudis prefers to play with his right foot, as do 82% of his teammates. He was used in three of the matches in the present term. He stands 177cm high and thus is about the same height as his team on average. Since Stathis Vasiloudis came into world in 1996, to be more precise February 23rd, the forward is one year younger than Panaitolikos'' average player. He is currently seventh in Super League (Greece) and third in group Gr. 3 of Greece Cup (Greece) with his team Panaitolikos. On the whole, he joined the pitch 23 times and left it four times after the start of the match. In the present term, he played less games from match start. Panaitolikos'' number 33 is Stathis Vasiloudis. He played 27 matches in total and hindermost appeared yesterday. Merely twice a card was given to him in his tenure. 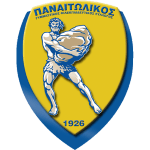 Panaitolikos has four more forwards in their squad, namely Nicolas Mana, Vlad Morar, Alhassan Kamara and Admir Bajrovic. In terms of worst seasons ever,Stathis Vasiloudis had a lot of trouble with penalties and hitting the net once,. His squad lost 50% (40% home) in Super League and concluded in a tie in 67% (0% home) in Greece Cup. The highest win streak of the last 5 matches happened in Super League with a count of 2. His longest stay in a team counts three years and 4 months in his current club. The briefest time Stathis Vasiloudis's spent on a team counts 40 months in his present club. He managed to attract a lot of good feedback after his performance at Greece, the team he was subjected to before joining Panaitolikos. Considering he weighs around 154.32lb, Stathis Vasiloudis is approximately 7lb lighter than the average player of Panaitolikos.